Cannes is still a stronghold of traditional cinema, as its ongoing row with Netflix keeps reminding us. And contrary to the Cannes Lions, the film festival hasn't yet become the choice destination for digital, disruptive storytellers. Last year's inclusion of Alejandro Gonzalez Inarritu's immersive piece Carne Y Arena in the official selection was nothing more than a timely exception. This year, VR was once again confined to NEXT, the Film Market's section dedicated to innovation (with the inevitable blockchain being touted as the next trend in film distribution). Buried inside the "bunker" (aka Palais des Festivals), NEXT's 150 title market line-up was mostly a compilation of pieces that have already been shown on the festival circuit (Sundance, SXSW or Tribeca), with just a handful of premieres. Many producers are holding their new projects for Venice, which launched a dedicated competition last year, with an impressive setup to showcase VR as an artform. Still, there were some interesting experiments on show, not to mention fresh tools and accessories that are helping to push virtual reality forward. Here's what we saw at this year's Cannes Film Festival. With so few new pieces, Cannes was more an occasion to catch up with the best immersive content that premiered earlier this year at the leading North American festivals, such as Fable Studios' first episode of The Wolves In The Wall, a beautiful VR adaptation of Neil Gaiman's children's book, or the first instalment of Spheres, the Darren Aronofsky-produced spatial series, in which you get to embody a star and experience what happens when you get sucked into a black hole. Among the standout pieces getting a second run at Cannes, we should also mention BattleScar, an animated short produced by French studio Atlas V, which follows Lupe, a Puertorican-American girl (voiced by Rosario Dawson), through New York's rumbling punk rock scene in the late 70s. This quirky, energetic piece makes clever use of the spherical space, alternating tiny 3D sets with floating 2D elements to create a compelling and stylish lean-in experience. Two more episodes are due later this year. Another noteworthy piece was Vestige by Aaron Bradbury (LoVR), a 10-minute, room-scale, non-linear documentary exploration of memories. As you navigate the space in this touching story of loss and grief, you trigger new narrative branches, opening alternative pathways that make Vestige a unique experience. Baobab Studios has been a household name in the animated VR world for some years now (Invasion!, Asteroids, Jack). Premiering at Cannes, Crow: The Legend's first chapter, written and directed by Eric Darnell, is based on a Native American tale about a crow who seeks to meet the almighty to bring back heat to the forest animals stuck in an endless winter. Voiced by John Legend and Oprah Winfrey, the first chapter of Crow is a sweet, mildly interactive 12-minute stand-up piece for Oculus that confirms Emmy-winning Baobab Studios as one of the leading voices in immersive animation. The second chapter is set to debut later this year. 360 degree video was never more than a gateway to more immersive experiences. As VR headsets like the Oculus Go are getting more powerful, cheaper and portable, we can safely say the days of rotating swivel-chairs and stiff necks will soon be over. With creative software also improving dramatically, creators are turning their experimentation to more immersive, personalised and interactive experiences. At Cannes NEXT, a few augmented seated experiences were on display to showcase how customised viewing devices can enhance immersive content. Being an Astronaut is a companion experience to the two part 360 degree documentary Dans La Peau De Thomas Pesquet, which follows the French astronaut from the Russian training facility to his six month stay on board the ISS. Seated on a Cosmorider chair, you're in for a five minute amusement park-type ride into space. No interaction, a few shakes and rumbles, and back to earth. 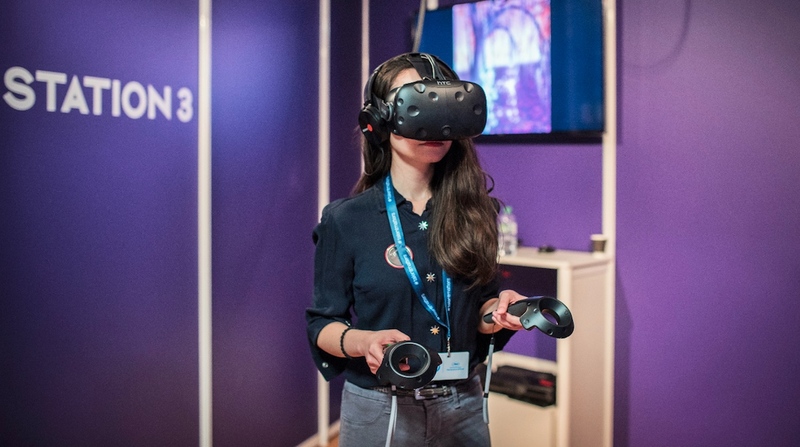 At another booth, Positron and Intel were showcasing the Voyager, a full motion VR pod, which visitors could experience with companion pieces such as Dunkirk VR, Isle Of Dogs VR, and oddest experience of all, Le Musk, a romantic comedy from Indian composer AR Rahman, augmented with scents. The seat rotates 360 degrees and pitches with six degrees of freedom in sync with narrated movement in the storyline, delivering smells via a spritzing device attached to the pod. Immersion like nothing else, but what does it need to really thrive? The most interesting advancements shown at Cannes were on the creative tools side, with volumetric capture technologies rapidly becoming the reference standard for VR content creation. DVGroup, the leading French VR and digital innovation studio that stunned Cannes and Venice last year with their immersive live theatre experience Alice, unveiled VolumeCapture, a tailor-made solution that enables real-time 3D filming in conditions similar to traditional shootings. DV showcased this impressive technology during live shooting sessions at their Cannes offices, summoning the ghosts of Ed Wood and Bela Lugosi – both played by live actors – to present creative filmmakers with an all-in-one volumetric solution that captures 2D and 3D images at once, and enables immediate previews, including in VR. Another interesting project was showcased by Swiss company Imverse, which has developed a technology that can create an entire 3D environment from a single 360 degree photo. Imverse can then drop you, the user, inside the experience, using real-time volumetric capture. Since everything is captured (including time), you can rewind the experience and meet yourself in what feels like a frozen moment. At Cannes this year, a major trend was figuring out ways to sustain the production and distribution of cinematic VR, which remains a niche for a somewhat limited audience. Traditional film and television being mostly funded by distribution deals and pre-sales, it will be interesting to watch how this chicken-and-egg situation evolves to fund quality immersive content beyond proofs of concept or "To be continued when funded" episodes. So far, most VR content studios have been building their own hardware and software solutions to overcome VR production challenges. On the distribution side, the landscape is slowly converging, giving rise to VR-focused solutions providers, such as French film and VR distributor MK2, who after opening a major VR venue in Paris, is now going international, taking care of everything from content acquisition to tailor-made delivery systems geared toward location-based VR centres.